Age distribution of annual sea ice minimum, 1984. Map based on satellite data showing sea ice in the Arctic at its minimum level for 1984. The ice is shaded according to its age, which ranges from over four years to less than a year. Ice that is present for more than a year is known as multi-year ice or perennial ice. It starts off around 2 metres thick, but can reach a thickness of over nine metres. 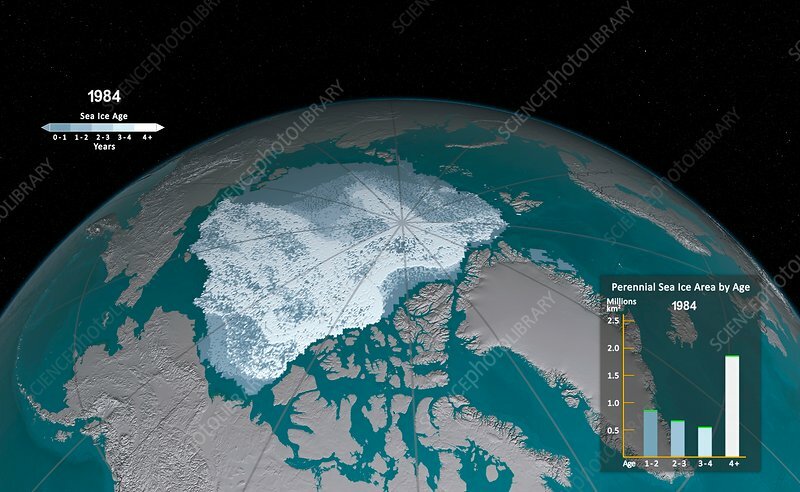 The decline in perennial ice in the Arctic is an indication of climate change. Keys to the shading and the distribution by age are at top left and bottom right. This data was obtained using a variety of satellite sensors, and is provided by the National Snow and Ice Data Center (NSIDC). For a map displaying the data for 2016, see image C030/8628.